So guys here is another post about Google camera, in this post we are covering that how to use pixel 3 Google camera on redmi note 7. As you might know that Xiaomi has recently launched an amazing device redmi note 7, a successor of redmi note 6, and I would like to tell you that redmi is now a sub-brand of Xiaomi just like the POCO. So the device comes with 6.30 inch full HD+ display with a dew drop notch, it is powered by Qualcomm Snapdragon 660 chip-set which is clocked at 2.2Ghz, the redmi note 7 has a 12 megapixel primary sensor and the aperture size is f/2.2, also it has a 2 megapixel secondary camera for depth sensing. Also redmi note 7 does support fast charging with Qualcomm quick charge 4.0 and yes it comes with USB type C Port, it has 4000mAh battery and it does support Dual sim and dual VoLTE. 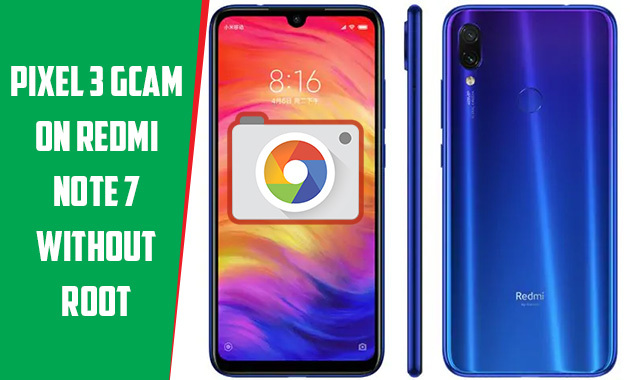 First of all I would like to tell you that this time we don't need to root or customize our device to enable Camera 2 API on redmi note 7 as redmi has enabled camera 2 API by default on redmi note 7 device. So this time, we don't have to root, or unlock bootloader to enable camera 2 api on it, as its already enabled by default, a big thanks to Redmi. As you might know that Google camera only works on the devices which support camera 2 API so the camera 2 API is already enabled on redmi note 7 out of the box, so we just need a proper camera port for redmi note 7 and just install that app like a normal APK and its pretty much done. So here are some working pixel 3 camera ports for redmi note 7 just download them on your redmi note 7 and install and enjoy shooting amazing, detailed shots, most of the pixel 3 camera features are working on redmi note 7, like portrait mode, HDR Mode, night sight etc. Now just tell me that what's the difference you have noticed on your Redmi note 7 in terms of picture quality after installing pixel 3 camera?